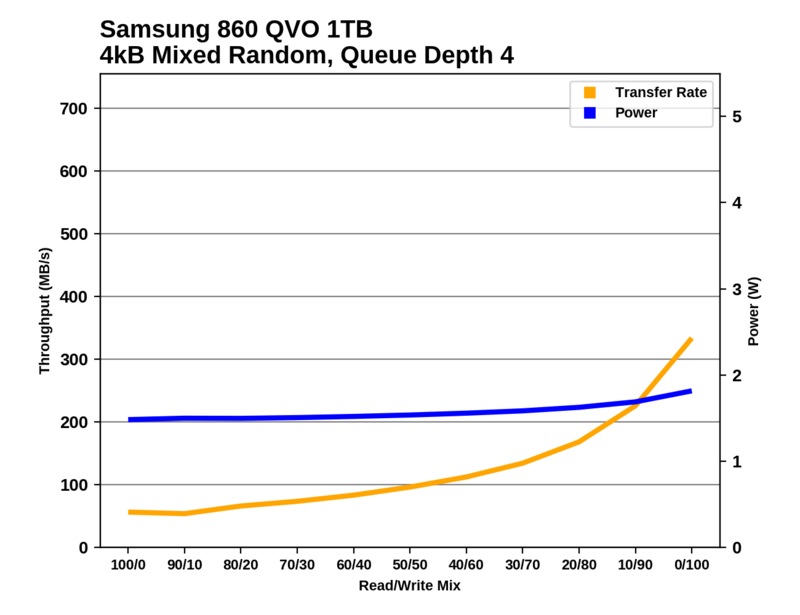 The Samsung 860 QVO's performance on the mixed random I/O test is substantially slower than the 860 EVO, but it is not far behind some of the other mainstream TLC drives. 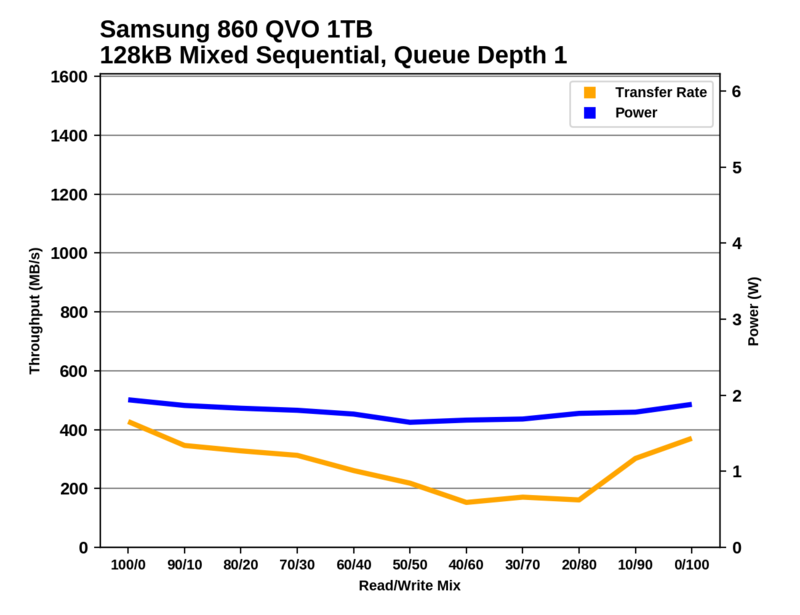 Running the test on a full drive does slow the 1TB 860 QVO down significantly, but it remains faster than the DRAMless TLC drive. 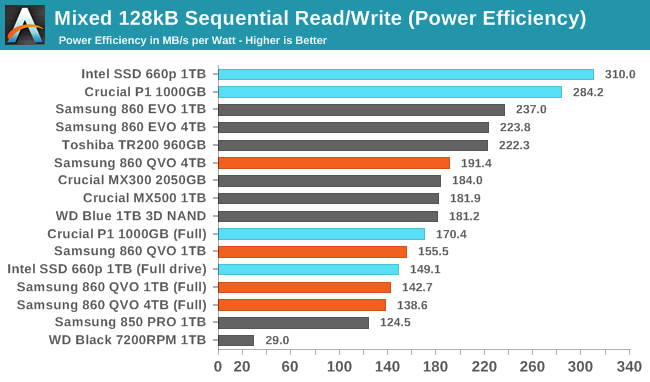 The power efficiency rankings for the 860 QVO aren't much better than the raw performance rankings. Power consumption is generally a bit higher than the 860 EVO but doesn't vary much with capacity or state of fill, so the efficiency scores are largely reflective of the performance variations. The 860 QVO starts out with a fairly slow random read speed but steadily speeds up as the workload shifts toward writes, eventually catching up to the 860 EVO. 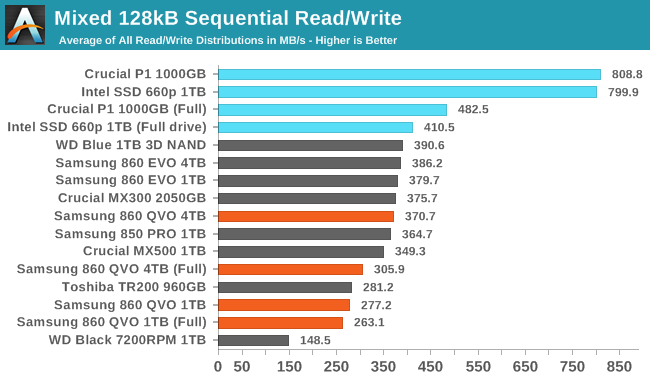 When the test is run on a full drive, the 1TB 860 QVO runs out of SLC cache in the final few phases of the test and slows down instead of continuing to speed up. The 4TB 860 QVO handles the mixed sequential I/O test well, but the 1TB model ends up slightly slower than the DRAMless TLC drive and well behind the mainstream TLC drives. 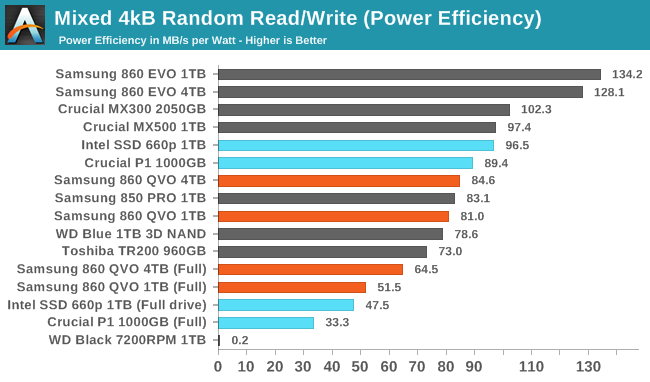 The power efficiency scores vary more among the SATA drives than the raw performance scores, so the 860 EVO and Toshiba TR200 stand out as particularly efficient while the 860 QVO 4TB is merely average and the 1TB model is struggling a bit. Both capacities of the 860 QVO offer decent performance at either end of the test with pure reads or pure writes, and they are unsurprisingly at their worst with the more write-heavy mixes. 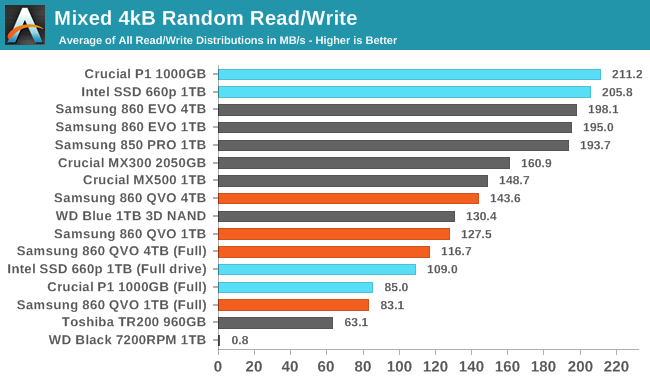 The 1TB 860 QVO loses far more performance across the first two thirds of the test, but catches back up with the 4TB model at the end.